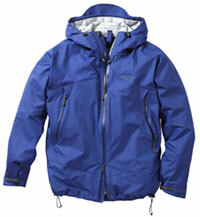 The Elite jacket is a good looking, shell that uses Rohan's own Barricade™ lightweight fabric. This short cut jacket is certainly light weight and although having a pretty minimalist design, does have a range of really quite impressive features. The sizing is, I think, quite generous. I normally wear an XL and was quite comfortable in a L. The sleeves are also a really good length. There are two very large, zipped front pockets - more than big enough for an OS map, and located so that they're easily accessible when wearing a backpack/daypack. There's also a third, zipped mesh pocket inside (also big enough for an OS map) which also functions as the jacket's own 'stuff-sack'. I was also impressed with the hood. It has a slightly stiffened peak and its fit is adjusted via a simple pull mechanism that adjusts the fit very effectively around the top of your head. Notably - there are no flapping adjusters at the front around your face. Once adjusted the hood provides good protection against the elements - the fitting mechanism is flexible enough to accommodate a woolly hat or other head gear. If not needed, the hood can be rolled down and secured in place out of the way. I've worn the Elite jacket now in light winds and light rain in quite a wide variety of Autumnal temperatures. Under these conditions it is waterproof (even in zipped areas despite there being no stormflap) and the breathability of the fabric is very good; the adjustable cuffs and hem provide some additional ventilation options. So far it's washed well and dries quickly. The manufacturer claims that the Durable Water Repellancy™ will withstand at least 20 washes ... and even at this point efficiency will remain at 80%. For more information on the Elite or on Rohan's Stridefit ( part social club, part fitness, part walking group) programme click here. I think you'd need a longer length jacket utilising a heavier fabric plus a storm flap on the main zip for high mountain wear and/or very challenging winter conditions - or if you were likely to be doing lots of scrambling. However - as part of a layering system, for lower/mid level walking throughout the rest of the year, Rohan's Elite is a good option. It's understated look mean that this jacket is also an extremely flexible addition to the wardrobe for travel and general leisure wear.